Homer V. Simpson owned the Antler's Tavern in 1943 until his death in 1965. 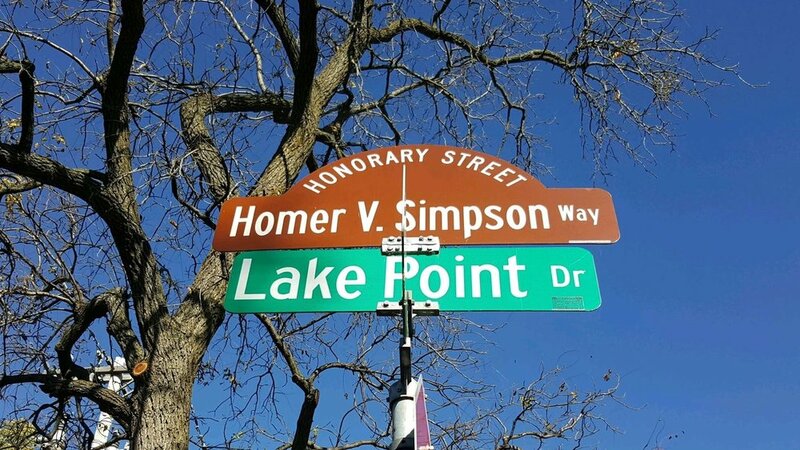 According to Isthemus news, the street being honored was previously named Simpson Street after Homer donated a portion of his land to the City of Madison. It was renamed Lake Point Drive in an attempt to revitalize the area in the 1990s. The bar is still owned by the Simpson family. Every summer since 2010 the long-time neighbors of the original Simpson Street have held a reunion. The organizers of this gathering petitioned to the City to have Lake Point Drive officially restored to the name Simpson Street. In 2014 the City decided to instead dedicate an honorary sign to Homer V. Simpson.